Purveyors of fine food and beverages in Oswestry since 1970. 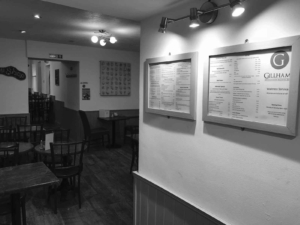 Located in the heart of Oswestry, Gillhams offers high quality food, served by our friendly, knowledgeable team. A wonderfully diverse range of delicious produce sourced principally from the British Isles. We endeavour to provide a friendly, relaxed and welcoming environment here at the Eatery. We are happy to help you cater for any event or occasion from a lunch menu at work, to an extensive buffet selection. Gillhams is an independent, family run Delicatessen and Eatery founded in 1970. 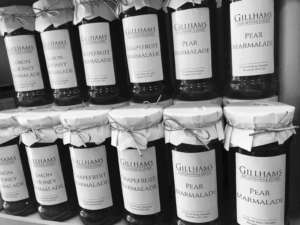 Owned by the Morris & Wolstenholme families, Gillhams has been successfully trading for nearly 50 years bringing you the finest quality products. Using our knowledge and contacts, we are able to provide the best local foods to the Oswestry highstreet. We have a selective range of English and continental cheeses. Our famous sandwich counter offers an extensive range of breads, creative fillings and seasonal favorites to suit all. We thrive on our delicious foods, delicate pastries and signature cakes. We have an extensive range of home cooked premium quality meats, artisan cheeses, specialty foods and freshly baked breads. 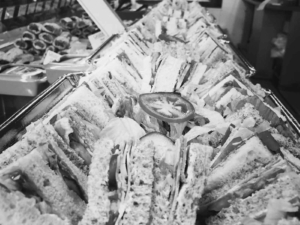 Our famous sandwich station offers a delightful selection of breads and creative fillings. Open every day from 8.00am until 5pm, we offer a great range of breakfasts, lunches and much more. Freshly made creative deli sandwiches, wraps, pies & homemade quiches are just a taster of our mouthwatering selection. It isn’t just about sourcing fine foods, we know that there are some things that taste best when freshly made, so our chefs prepare new dishes every day to ensure our passion brings you pleasure. We are happy to help you cater for any event or occasion from a lunch menu at work, to an extensive buffet selection. In addition to our deli and eatery menus, we will work with you to create the perfect menu for you and your guests to enjoy the best Gillhams has to offer. Please see our menus for more detail, or email us at rob@gillhamsdeli.co.uk and we can help customise a bespoke selection for you.